Journeyfix Travels are expertise in organizing Dubai Tour & Travel Services, Dubai Honeymoon Packages, Family Vacations. Dubai, popularly known as the Shopper’s Paradise invites you an effortless and hassle free tour with us and you will be covering all the important places like Abu Dhabi, desert safari, Burj Khalifa etc. The place beyond comparison can be fully enjoyed when you are at ease and hassle free, which you can experience with us. With our packages there will be you and your loved ones, having a great time together as we take all your responsibilities as ours and fulfill them in advance…just for you. The best part is that we do not charge extra for all these as experts with us are dedicated to satisfy the customers at their level best. Avail our world class holiday packages and make your tour an unsurpassed one. Dubai City Tours - Dubai’s tour companies offer a variety of city tours of different durations and at different times of the day. As the city is compact and the roads good, it is possible to take in most of the city’s major landmarks and sights. Dhow Cruise-Dividing the charming city of lights into two commercial districts, Dubai Creek epitomizes the citys personality. Here, the magnificent sophistication of the 21st century walks hand in hand with the simplicity of a bygone era. Desert Safari-No visit to Dubai would be complete without a trip into the desert. Such excursions whish are best Organized as part of a group tour, offer a taste of the true heart land of Arabia. The majesty and tranquility of the desert can be experienced in a choice of exciting half-day, full-day and overnight safaris. Camel Riding- The camel, a symbol of Arabia, is also a major tourist attraction. Camel rides are part of some tours & desert safaris. Tour operators and hotels can also arrange camel rides separately. Dubai Zoo-Oldest zoo of its kind not only in the United Arab Emirates but also in the Arabian Peninsula. Dubai Zoo also happens to be the first Arabian zoo to breed the rare Chimpanzee and Arabian wild cat. 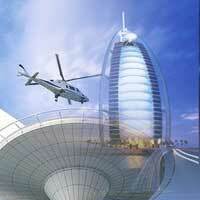 It is a special place of interest and fun for tourists and the people of Dubai. Birdwatching Tours-With nearly 400 species of birds observed in the emirate, Dubai attracts many birdwatchers. Customized Birdwatching tours range from a day or two to a week or more, and take in the full range of landscapes, from parks and golf clubs, to desert, mountain and Creek. Hatta One hour’s drive from Dubai City is the ancient fortress village of Hatta, home of the Hatta Fort Hotel, Dubai’s only mountain resort complex. The drive is as fascinating as the destination itself, taking the visitor through burnished sand dunes and mountains varied in color. Tours cover the recently renovated old fort and a trip through Wadi Hatta with its lush greenery and diverse wildlife. The village, which is more than 200 years old, and Juma Mosque, which stands amid palm groves, are other tourist attractions. Dubai Museum-Al Fahidi Fort, which houses the Dubai Museum, is another imposing building. It once guarded the city’s landward approaches. Built around 1799, it has served variously as palace, garrison and prison. It was renovated in 1970 for use as a museum; further restoration and the addition of galleries were completed in 1995. Colorful and evocative dioramas complete with life-size figures and sound and lighting effects vividly depict everyday life in pre-oil days. A gallery rescans from the Creek, traditional Arab houses, mosques, the souk, date gardens, desert and marine life. One of the most spectacular exhibits portrays the underwater world of pearl-diving, and is accompanied by sets of pearl merchants’ weights, scales and sieves. Dubai- located in the north east of the United Arab Emirates and is the country's principal commercial center, chief port and the capital of the state of UAE. It is one of the world's few locations where modern city life, sandy beaches and the desert are all within easy reach. Visit new landmarks, such as the world's tallest building, the Burj Khalifa, and the inspiring Dubai Fountains. Experience the culturally significant. Dubai has been dubbed the ‘Paris of the Middle East' due to its captivating charm, distinctive culture and enchanting character that exudes a luxurious way of living that many only dream about. The surrounding area is home to a unique blend of timeless deserts which contrast with the modern city buildings that help to make Dubai such a mesmerizing holiday destination. Emirates, Air India, Jet Airways, Indigo, and SpiceJet & Other Airlines too. Arabic is the official language while English and Urdu are also widely spoken and understood.